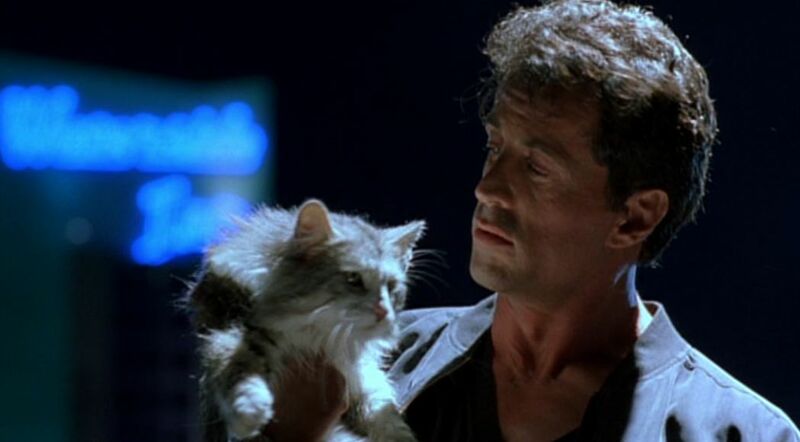 In this massively entertaining load of old tosh, Sylvester Stallone plays Ray Quick, a gentler, kinder kind of ex-CIA bomber who as early as the opening credits is already demonstrating his sensitive side by adopting a stray cat, which he calls “Timer”. While Ray is busy whipping up a needlessly elaborate device to blow up one of his hammy co-stars (James Woods, Eric Roberts, Rod Steiger, Sharon Stone), Timer proves he’s not just a CATPANION but a CATAPHOR by pouncing on a mouse. Yes, this bomb business is… wait for it… a Cat and Mouse Game. Ray lives in such a vast hangar-like industrial space on a Miami waterfront, you can’t help wondering how none of the people who have been looking for him all the way through the film have spotted that he’s there. Anyhow, he has rigged it explode. As you do. Cat lovers will appreciate that during the pyrotechnic finale, in which lots of big explosions are going off all over the place, director Luis Llosa takes the trouble to show Timer disappearing safely down an escape hatch. This entry was posted in Cataphor, Catpanion and tagged The Specialist. Bookmark the permalink. Oh my Lord yes, it’s John Barry, isn’t it. Thank you for reminding me of that. A vastly entertaining film. I love it. The exploding teacup! James Woods and his Biro! So did the cat survive the explosion in the movie? Read the last paragraph again!